FenderMate Prime is a unique combination of a preparation shield and matrix for Class II fillings of primary teeth where quick and simple solutions are highly valued. FenderMate Prime is an interproximal plastic wedge with an inbuilt steel plate. The "boat-shaped" tip allows the gingiva to be compressed without damage and reduces the risk for bleeding. FenderPrime Green (long) can be shaped to the contour of the tooth. The importance of protecting a permanent tooth is obvious. FenderMate Prime gives this protecting shield during preparation of a distal cavity on tooth 75. FenderMate Prime Green/Long is used because we expect it to be a wide cavity. When the preparation is finished, and if the plate is without holes, the combined wedge and shield is bent to adapt to the contour of the tooth. The restoration material in this case is light-curing glass ionomer. FenderMate Prime Yellow/Small is used because it is more rigid and suitable for use in tight interproximal spaces like this. The cavity is small and there is no need to bend the wedge/plate. Good advice is to check the cavities for food impaction with a floss before applying the FenderMate Prime. Here protection of the adjacent tooth during preparation is not required. The FenderMate Prime in place will protect the papilla and prevent injury and bleeding. The preparation of the two cavities can be carried out simultaneously with the restoration, in this case with light-cured glass ionomer. FenderMate Prime secured with waxed floss. 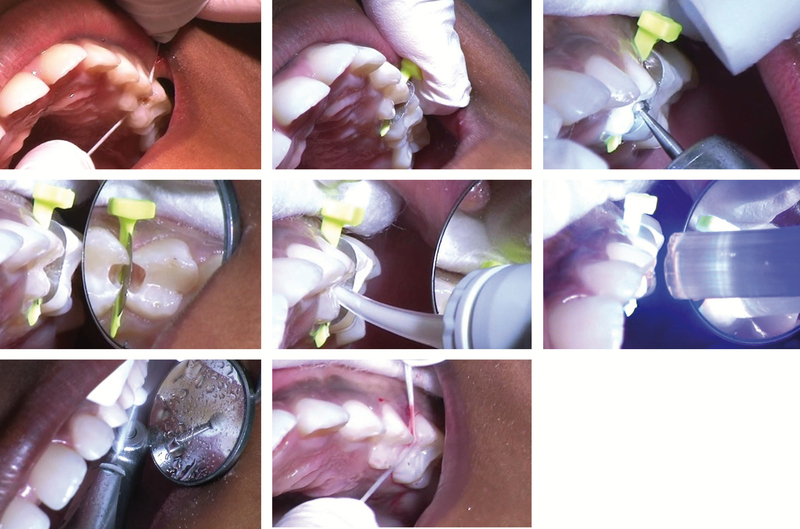 Preparation of both cavities and filling with light-cured glass ionomer simultaneously. Rubber dam for security. FenderMate Prime Green/Long bent round the cavity to adapt to the contour of the tooth.